Sweet potato fries are my weakness. Put a plate in front of me, and I will devour the whole thing in a couple minutes. I’m a generous person, but please don’t expect me to share my fries. Fried or baked, restaurant or home made, I love them all. 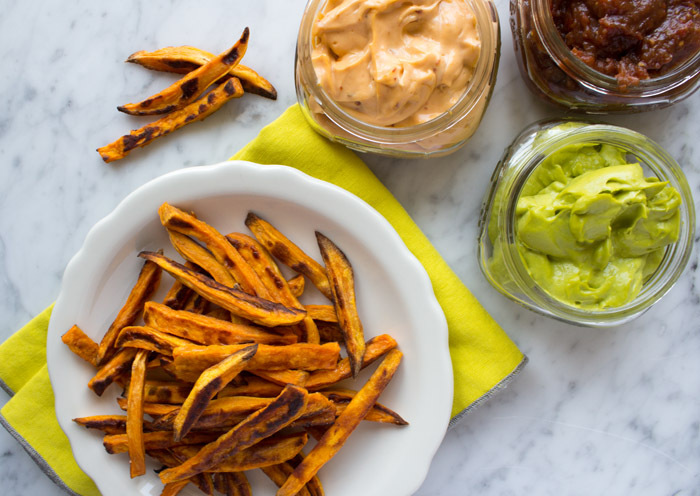 And if you’re as in love with sweet potato fries as I am, you should be making them at home. 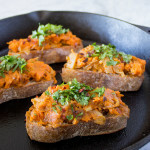 Baked sweet potato fries are obviously much healthier than their fried counterparts; and just as delightful and delicious. They make a great snack, side dish, or entree (if you’re me). Plus they’re an ideal vessel for vegan dipping sauces. 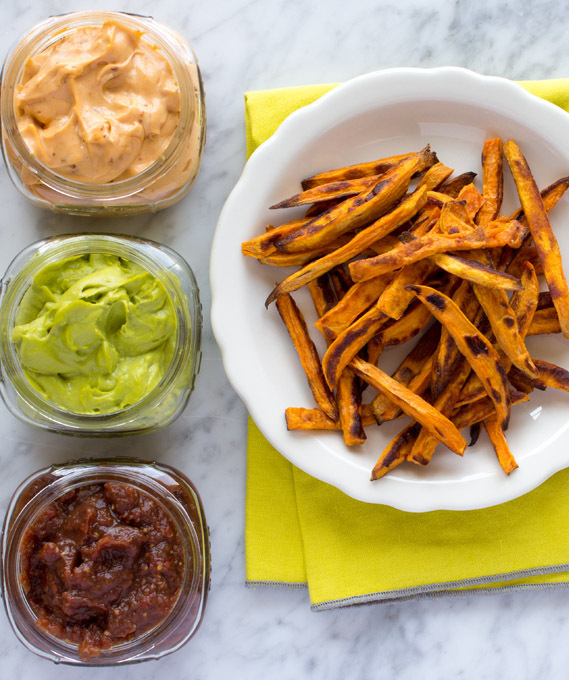 Make sure to soak the cut sweet potato fries for an hour before baking. This will help to remove the some of the starch, and will allow for a crispier baked fry. 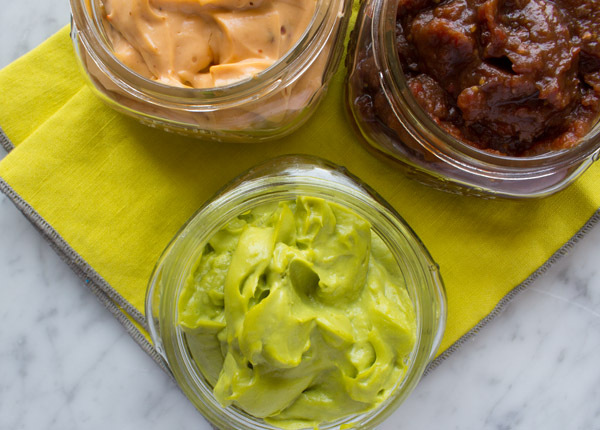 For the avocado wasabi and tamarind ketchups you'll need to use a food processor. A blender could work, but expect to have a difficult time getting all of the sauce out from the bottom of the machine. I use a Cuisinart food processor, and highly recommend it. 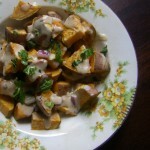 Soak the cut sweet potatoes in cold water for 1 hour. Remove the sweet potatoes from the soaking water, and dry them with a clean kitchen towel. Toss them on a baking sheet with oil, and spread them evenly on the sheet. Top with a sprinkle of salt before baking for 30 minutes. Flip the potatoes about 20 minutes into the baking. Place the vegan mayo, chipotle pepper, and lime juice into a small mixing bowl, and whisk until combined. Place ingredients in food processor and blend until creamy. You'll probably need to press down the sides of the food processor a couple of times to make sure it all gets blended. 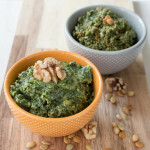 Place ingredients in food processor and blend until blended. Blend until smooth, or leave a bit of texture in the ketchup if you prefer. You'll probably need to press down the sides of the food processor a couple of times to make sure it all gets blended.